As part of the Lineage II installation, you are required to have the HSR Launcher. The game launcher will deliver Lineage II-specific updates and expedite the game launching process. Download links to programs needed / required. 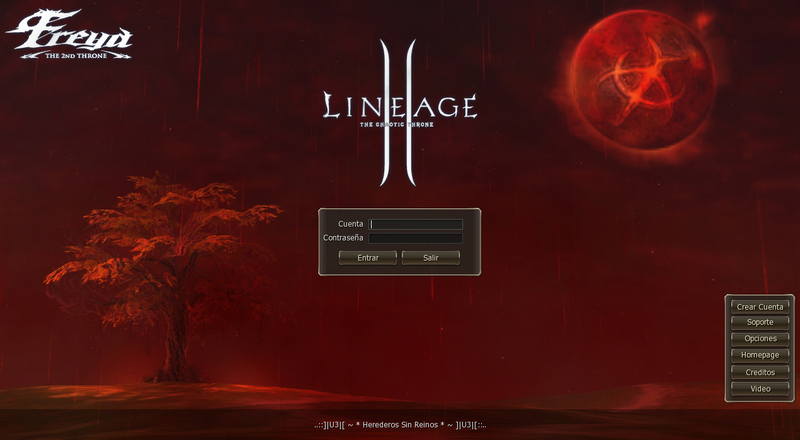 Before you download and install the Lineage 2, make sure your computer has the necessary settings to run the game. To do this, go to the icon "My Computer", click the right button and go to "Properties" then go to "Manage Devices" and compare with data from the table below. You can also get help on your settings in our Forum. CPU: Intel® Pentium® 4 3.0 GHz equivalent or above. Memory: 1 GB or more RAM. Video Card: NVIDIA® GeForce® 6600 GT or ATI/AMD Radeon™X1600 Pro 256MB or above. Online: 56k Internet connection or above. Direct X: 9.0c or above. 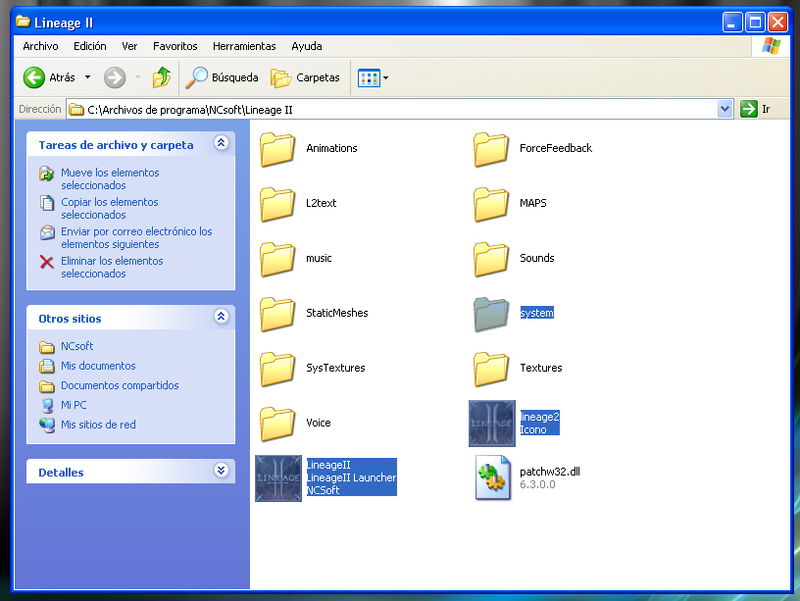 Operating System: Windows XP / Windows Vista / Windows 7 / Windows 8 or above. Once downloaded the client, proceed to installation. To start the installation, run the executable named "setup.exe". The executable is in the inside the client files that you have downloaded. A) Next for start the installation. 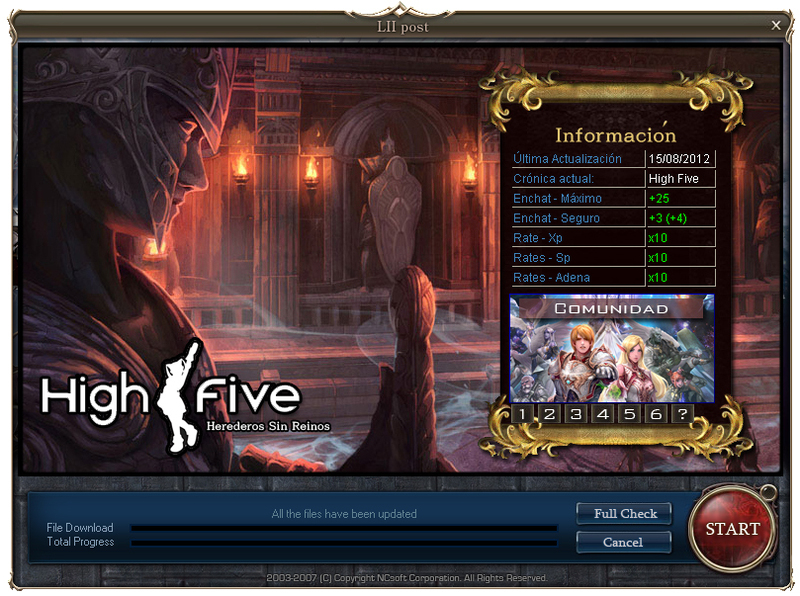 Complete: Install the game with all default data. 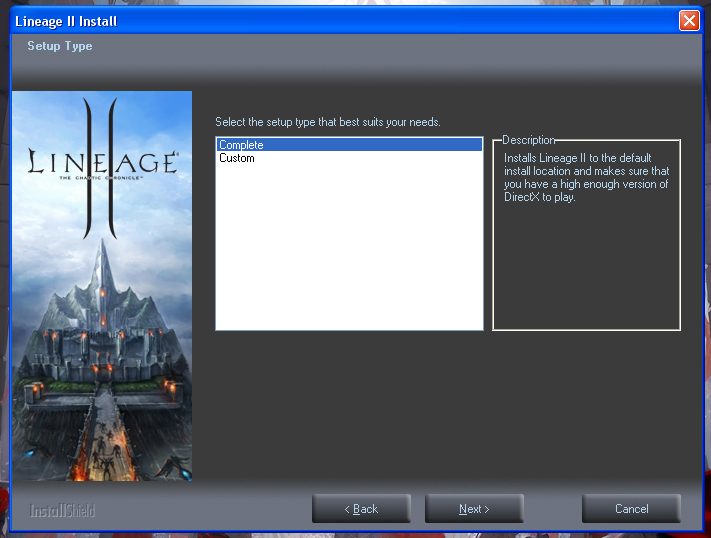 Custom: Install the game but we configure it, example: upgrade installation path. 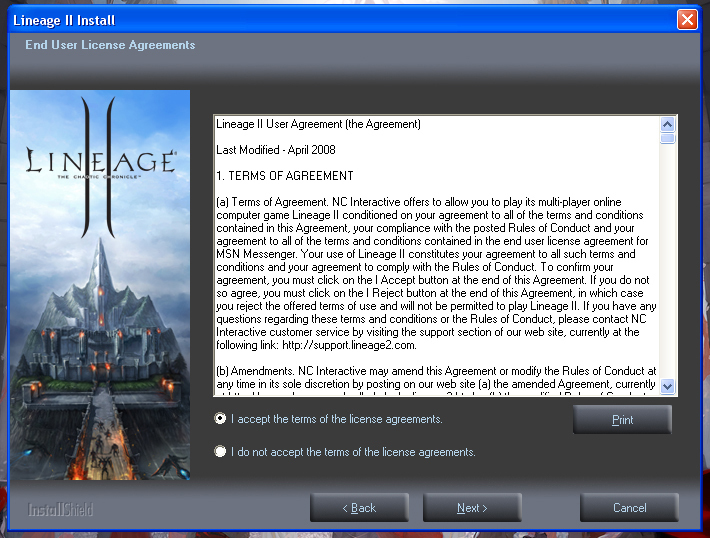 C) Accept license agreement to continue with the installation. D) Now, click install to begin the installation. E) Attention!! Deselect options and click on "Finish" to end. Congratulations: You already have the game installed on your pc! 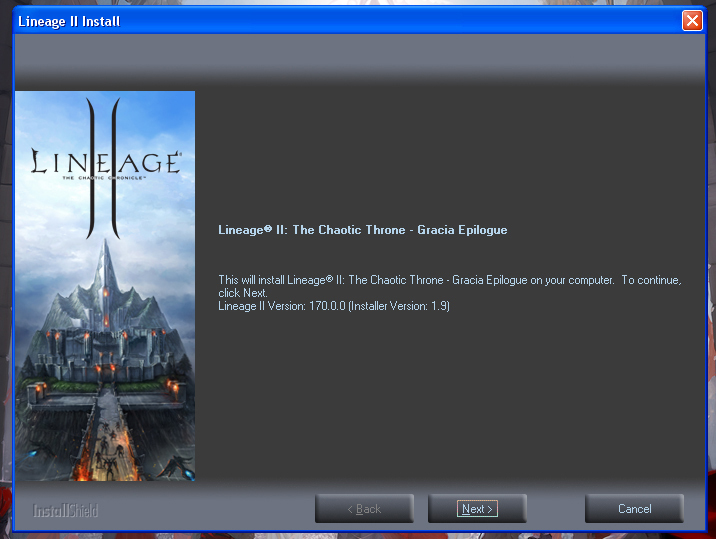 L2Updater is an executable with which to begin the game and have it always updated, this is an updater for your client. 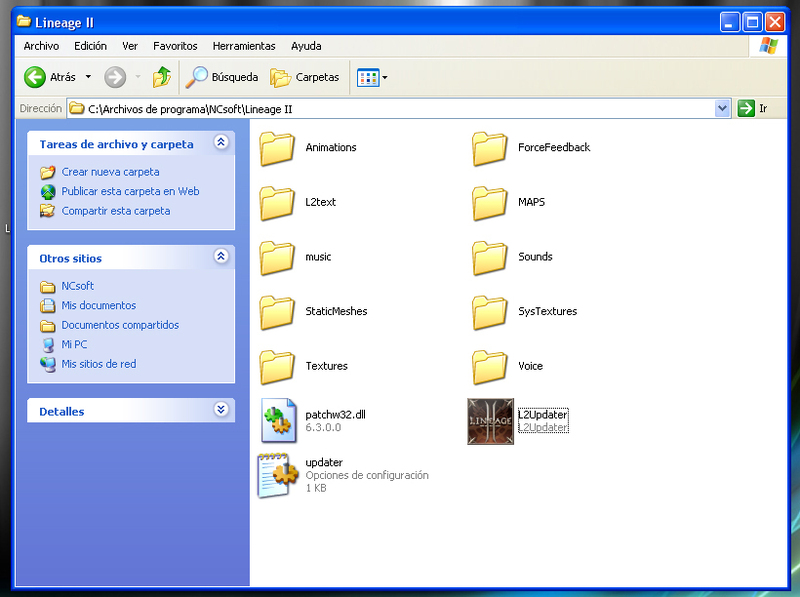 With this executable, we will have our adapted and updated to the latest available revision client. If you do not have the updated client, possibly you will have serious problems when playing. It really requires no installation, you just have to incorporate it into your client. Unzip the downloaded file and paste its contents into your client. Now, run the "l2updater.exe"" and began to update the client. To update the client click on the "Full Check" button. Congratulations: You already have the game full updated! Click the "START" button of L2Updater or L2.exe to client and start the adventure. NOTE: The name of the characters must start in upper-case. © 2000-2017 United Extreme. © 2008-2017 U3Games. Design by Swarlog, all Rights Reserved.